The WLAN 802.11ac standard adds new features such as larger channel bandwidth, higher modulation schemes and MIMO. This significantly increases data rates to cope with future high data rate applications such as wireless displays or video streaming. The webinar provides an overview of the 802.11ac standard and explains its main operating principles and important changes compared with the previous 802.11n standard. 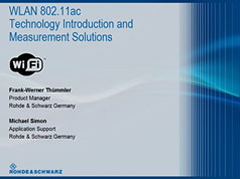 The webinar also outlines the challenging test requirements the new features bring about and shows the 802.11ac test solutions from Rohde & Schwarz. Measurement examples of typical transmitter tests are also demonstrated and explained.